Grasslands are wide tracts of land that are made up of grasses, flowers and herbs. There are few shrubs or trees in this biome. The dominant type of plants are grasses, but they also include a good number of wildflowers such as sunflowers, wild indigos, clovers and blazing stars. Buffalo grass is a type of grass which grows mainly in the North American prairies. The climate of the North American prairie is dry during the summer and cold and windy in the winter. Buffalo grass is perennial shortgrass which grows to between 2 and 5 inches. 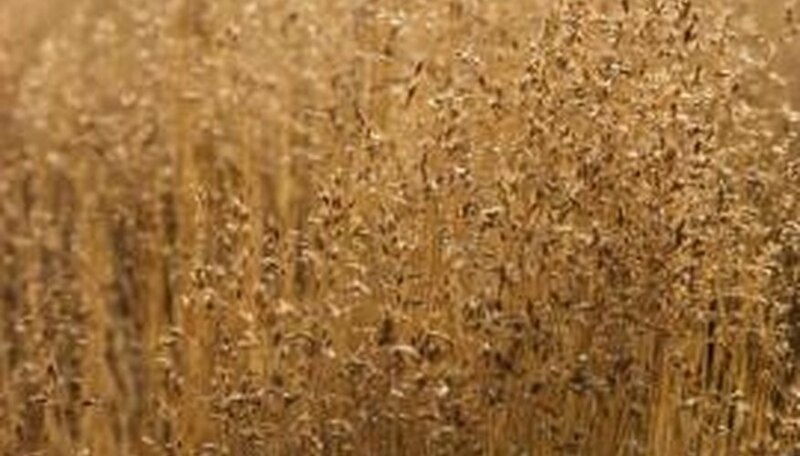 The grass turns brownish-tan in the winter and lavender in the autumn. The main characteristic of buffalo grass is its hardiness; it is drought resistant and goes dormant in the dry season. It is also cold- and heat-resistant. Buffalo grass is a source of food for buffalo, jackrabbits, prairie dogs, white-tailed deer and other grassland animals. Another characteristic of the buffalo grass is that it is fire-resistant; this is due to the fact that the growing parts of buffalo grass are located in the soil, where they are protected from the fire. Goldenrods are herbaceous perennial species that are found in grasslands, pastures and meadows. Goldenrods grow from woody caudices or rhizomes and have many species, which can be hard to differentiate due to the fact that they all have similar golden yellow flower heads that bloom late in the summer. The pollen from goldenrods is heavy and sticky, making it rather difficult for it to be wind-pollinated; thus, the plant depends on insect pollinators. Goldenrods are common in the dry and mesic prairie region. The wild indigo is a wildflower that is native to the grasslands. It is a member of the bean family, and has a trifoliate leaf arrangement. Wild indigo have several species, which include the Blue Wild Indigo (Baptisia australis) and the White Indigo (Baptisia alba). The Blue Wild Indigo blooms between May and June, while the Wild White Indigo blooms later in the season. Purple needlegrass is a perennial bunchgrass which can live up to 150 years. Purple needlegrass can be found in temperate grasslands from the Oregon border into northern Baja California. This species has the same dominant characteristic as most grassland plants: it is able to withstand long periods of drought.